In my six years living in New York, I can only remember a handful of times spent below Canal street. I worked and played from Soho to Harlem, from Alphabet city to Chelsea, but somehow the Financial District never got much love from my well traveled city feet. Once I moved out of New York I began spending much more time south of Houston visiting friends who had moved downtown. The past two weekends have given me a taste of everything I was missing! My friend tipped me off to a great new hotel app, Hotel Tonight which I used to book both of my weekends in the city. Download this app for access to discounted prices on rooms that hotels have yet to book. It's extremely helpful and very easy to use. The first weekend we stayed at the Courtyard Marriott Downtown for just $99 (a ridiculously cheap price for NYC). We were upgraded at check-in and had a beautiful room with floor to ceiling views of the Freedom Tower. This past weekend I booked a stay at Gild Hall, which was very luxe. We were treated to prosecco upon arrival which we sipped as we unpacked and changed for our evening ahead. Let's start with the must-knows: Navigating Lower Manhattan can leave you walking in circles; it's a maze down there. I highly recommend that you're familiar with navigating Google Maps, or my personal favorite offline map app Ulmon Pro. None of these streets are numbered, and there is no grid to follow, just a lot of weird intersections and street names like Gold and Fulton. A map is a must! Once you've settled into your accommodations the first thing to do is eat. Or drink. Or both. I always check out my hotel bar or restaurant because 1. it's easy and 2. it's usually great at most hotels in the city. Last weekend we started off our evening with a walk to Stone Street and dinner at the Stone Street Tavern. 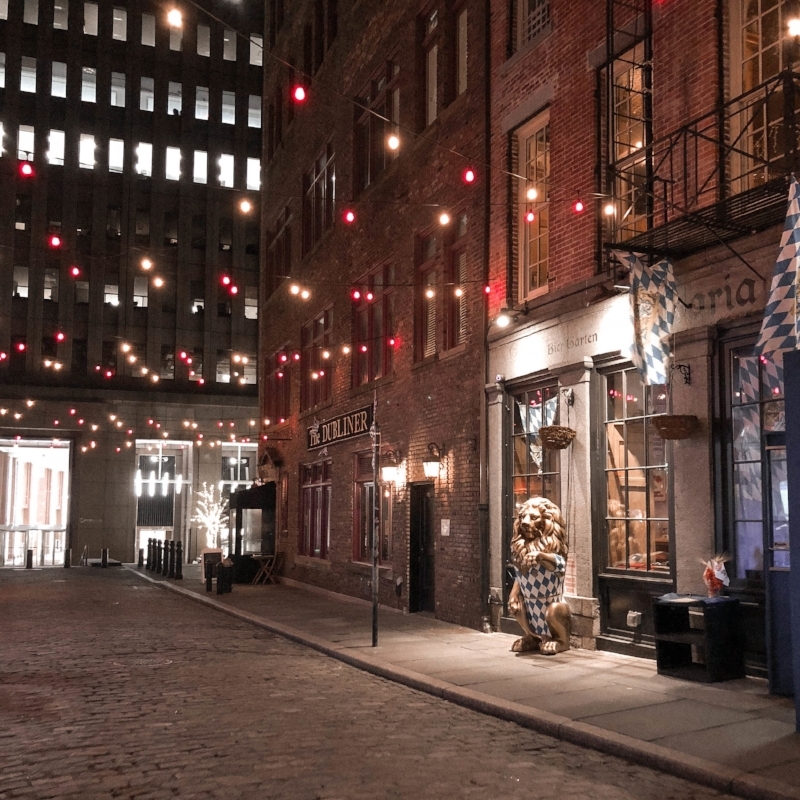 Stone Street is an extremely cute and Instagram-able cobblestone lane filled with restaurants, bars, and lots of string lights. In the summer it's crowded with outdoor tables and evokes memories of European city nights. If you're interested in a more trendy scene for dinner, I recommend heading over to the Lower East Side (LES for short). When I stayed in the city for a Fashion Week event I ended up at Beauty & Essex, a well known spot moonlighting as a speakeasy. We ate dinner at midnight, drank dollar champagne in the bathroom and although the music was too loud and the food overpriced we still had a great time. Our waitress recommended Pianos, another well-trodden spot for early morning 'ratchet' dancing (her words, not mine). I've been to Pianos several times and it's always a good spot for a long night out. Check their events to see what's going on that night; they have everything from local bands to burlesque shows. When we went, it was all about the dancing. Once we had our fill we grabbed a taxi back to our hotel and fell into bed. Waking up in New York on a weekend is a lazy affair. I'm all about taking my sweet time and going with the flow. Order room service if you're feeling boujee or head out for that ultimate city ritual: Brunch. Last weekend my friend took me to Dudley's, a cafe situated in between Little Italy and LES. It's a casual yet hip spot with a long wait on a late Saturday morning. We put in our names and then crossed the street to get a coffee at Irving Farm. We sat and chatted for about an hour before heading back over to Dudley's to snag our table. They offer all the staples: avocado toast, fresh squeezed juices, matcha lattes, home-made granola and more. From Dudley's we spotted a gorgeous shop on the opposite corner called Tictail. We crossed over and spent some time admiring the artisan crafted clothes, shoes, jewelry and nicknacks artfully displayed throughout the store. I really loved the premise of this store and am definitely going to spend some time browsing their online retail shop. The rest of our afternoon was spent moseying around the area, stopping to take photos outside Essex Street Market, and entering any store fronts that caught our eyes. We tried to pop in for a manicure at Chillhouse but they were completely booked, so we caught the subway back to Gild Hall to regroup and decide where to go for dinner. That night we ended up at a modern Italian restaurant called Gelso & Grand in the heart of Little Italy. I suggest making reservations before hand if you are in the city on a weekend. We had another wait ahead of us so we warmed up with some spiced mulled wine at the bar as it began to snow outside. Once seated we both enjoyed a pasta dish followed by the most ridiculous dessert I've seen in a long time. It's called the Unicorn Cannoli and if you know me well, you know I had to have it. It's a monstrosity of sugar at least 10 inches long with lavender and berry cream, funfetti, cotton candy, and a shell covered half in coconut and half in sprinkles. It comes with an actual wooden mallet and a tiny unicorn sign that says, 'Smash Me'. Very tongue in cheek if you ask me, wink wink. After we ate our fill of Unicorn Cannoli, we ran through the snow to Genuine Liquorette (again conviniently located across the street). A bar filled with neon signs and lots of 80s vibes, Genuine Liquorette is a great spot to come for a good drink and a laid back atmosphere. If you snag a spot at the bar like we did, you're set for the evening. They have a funky menu, REALLY good drinks, and an excellent playlist. We sipped and chatted, did a little dancing and a lot of giggling and then made our way out before it got too packed. One cab ride later we were back in our room watching late night re-runs of Real Housewives of Atlanta. Sunday morning we were both ready to head back home at a leisurely pace. We grabbed a quick breakfast at La Parisienne Cafe before getting a mani-pedi at the nail salon around the corner. Then we made our way to Grand Central to say our good-byes. The past two weekends in Lower Manhattan were packed with great food, beautiful culture, and most importantly excellent company. What are your favorite places in New York? Have you been to any of the spots I visited? Let me know in the comments below!